You do not have to look very far in nature to find a palette of coordinating colors from which to pluck your house paint chips. This time we’re looking at a glassy pond reflecting the blue of the sky. This blue, however, is not a primary saturated hue but rather a complex shade that has grays and greens in it as well. So going to the paint store, you’ll want to move toward the muddy gray part of the fan deck and find your blue there. Stay away from the clear Crayola blues or you will end up with a house color that may in fact glow in the dark. Look carefully at the colors around the pond and you will find your accent colors. Autumn red for the door, dark woody brown for the front step treads, crisp cloud white for the trim, and pops of golden yellow for your flower pots. With nature as your color palette, you cannot make a mistake. When selecting the palette of colors for your exterior, use natural materials in the environment as your inspiration. This stonework has all the colors you need for your entire house, from the dark charcoal of the roof to the taupey gray siding and even the orangey brick walkway. Tying your house color in with its surroundings “grounds” the house — it looks like it belongs there. A house that strays too far from the natural palette looks more like a spaceship that has landed on a foreign planet. Don’t do that to your neighborhood. Save your taste-specific color applications for inside the house. Choosing House Colors: Lime Green? In many neighborhoods, the homeowners who chose this house color might be run out of town but not in this neighborhood where the color is prevalent in nature. The lime green (bordering on neon) fits right in! We see it here in the rainforest of El Yunque in Puerto Rico. What a happy, stimulating hue! And how appropriate to borrow it for a house color on that island paradise. It helps to pair this strong acidic color with a coffee brown or even black just to balance out the palette. But it works. Use your home’s environment as inspiration when choosing a house color. But if you do not see the color in nature’s palette, then reserve the color for inside. Otherwise, your home might become a lighthouse beacon in the neighborhood. Great for identifying your house in the dark, but that’s about it! Call it dark charcoal, call it midnight blue, or just call it black. It’s a knock-out house color that made me slam on the brakes when I drove by. What’s more dramatic than the pairing of opposites black and white, but who would think to put them on a house? Obviously somebody did and it looks spectacular. The soft yellow chiffon door is perfect. More lemon? Too strong. More orange? Halloween. And although I’m not a big fan of white shutters, they make sense here. Another convention that was slapped in the face was the idea that dark equals small. You don’t even notice how small this house is because it is so well put together. From the gray roof to the brick steps and pops of floral color, this house is a winner. 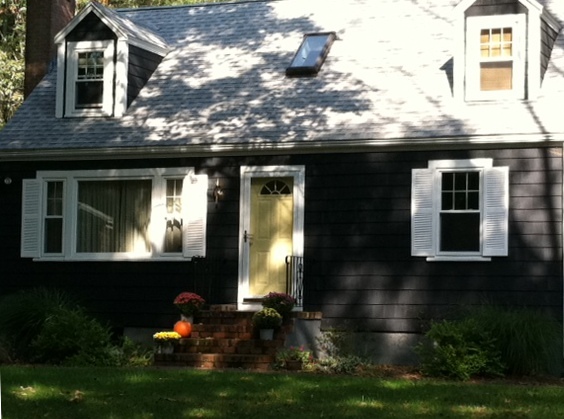 The beauty of this bold house color statement is that it fits perfectly in any neighborhood! Red, yellow, and blue are primary colors that attract attention. Used alone or in combination, they will definitely grab your eye. So it’s no great surprise that this house with its pale yellow siding, royal blue door, and red foundation plantings made me slam on the brakes for a quick photo. The first color you notice is the royal blue. 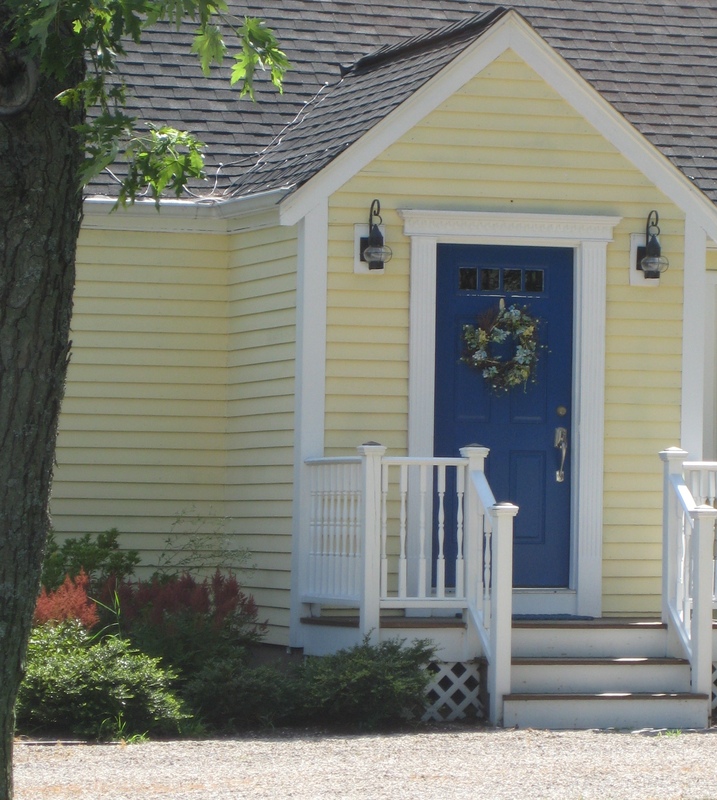 That shade is what many would consider to be the definition of “blue” and with the white trim around the door, it pops. And that is precisely what a front door should do. There should be no mistaking the front door for the service entrance (I just love saying that… you know what I mean … usually the door into the garage). 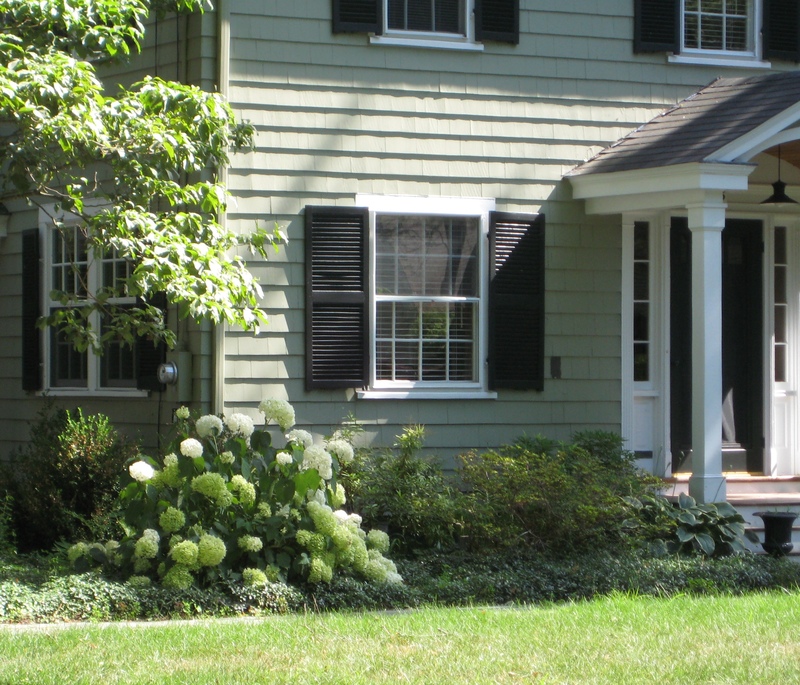 The front door does not have to be a primary color, for sure, but it should stand out significantly enough from the rest of the house to be a welcoming entrance, and there should be a clearly defined path leading up to it. Front doors that, despite their color, are obscured from view behind a large bush just do not function well. I’ve been to some houses that were so confusing that I ended up walking around the house into the back yard looking for the way in… (this happens primarily when there is no sidewalk or stone pathway to follow — the subject of another post). If you have two doors on the front of your house, be sure to let people know which door is preferable. Plantings, lights, and a visible doorbell or knocker will guide your guests to the preferred entrance and prevent your greeting partygoers in the mudroom. I suggest painting your main entry door the accent color and the other “service” doors the siding color. Then your guests will not be forced to choose between red doors, numbers 1, 2, or 3. These are little points in the grand scheme of curb appeal, but I just thought I’d mention them anyway. When it comes to landscape plantings, you don’t need contrasting color to make an impact. Look at this green house — not a single pink annual in sight. What makes an impact is the scale of the plantings like the big hosta and the white hydrangeas all in various shades of greens and creams — in front of a green house! Who would ever think! 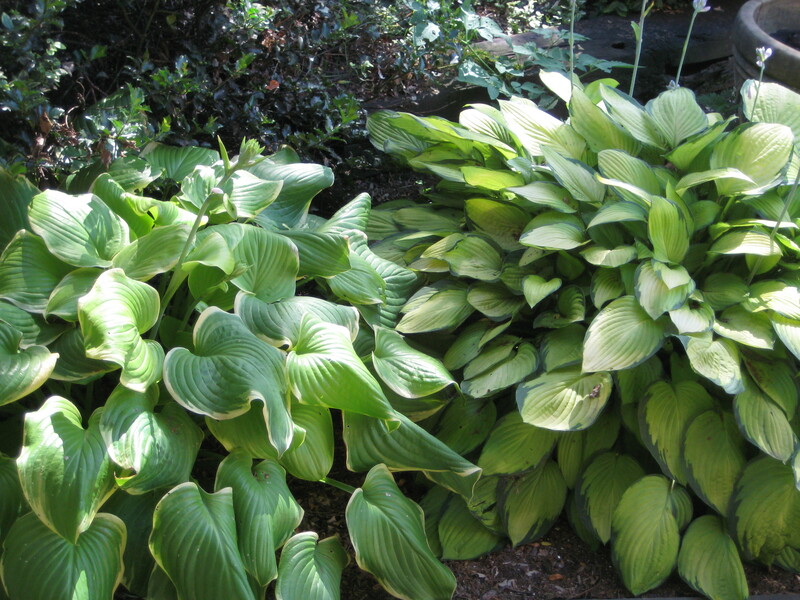 If you want a big bang for the buck (as they say), use large blooms (hydrangeas, peonies) and big leaves (hosta in various shades) to enhance your home’s summer curb appeal with minimal fuss. You are currently browsing the Landscape Color category at Your Home & Color Coach.